Virtual Reality may be going wireless with another untethered VR headset prototype just developed and one agency executive sees opportunity for brands in the future. The prototype, developed by VR software company Quark VR, uses HTC’s Vive VR headset connected to a computer board and battery back secured at the user’s waist. The battery can power the system for up to two hours of use, according to Quark VR. Removing the wires that are currently required for immersive VR systems is a step in the right direction for brands creating immersive experiences, according to Leigh Christie, manager of Isobar’s NowLab. Christie said the wireless nature of mobile-based virtual reality viewers will push higher-end VR systems, such as HTC’s Vive and Oculus’ Rift, to also become untethered in the near future. The Quark VR system design appears to be similar to at least one other wireless VR headset showcased at CES earlier this year. TPCast developed a wireless add-on device designed solely for the Vive headset. That system clips directly onto the headset, rather than running wires down to the user’s waist, and has a battery life of two or five hours, depending on the battery pack, according to HTC. 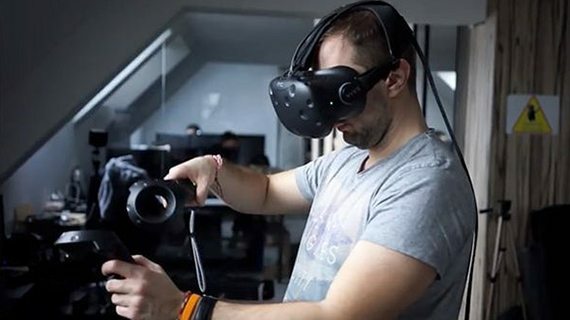 TPCast was developed in HTC’s Vive X business accelerator program and is expected to be available in the second quarter of this year for $249, according to HTC. Although the prototype from Quark VR is just that, the system is designed to work with any VR headset, including HTC’s Vive and mobile-based VR viewers, such as Samsung’s Gear VR and Google’s Cardboard and Daydream viewers. Content can also be streamed wirelessly to multiple different headsets simultaneously, according to Quark VR. Examples of other VR capabilities being explored in the market include inside-out tracking, which enables positional awareness without external hardware, and video pass-through, which enables the user to see his or her surroundings. With these features, the future of VR hardware may ultimately look more like augmented reality or mixed reality HMDs (Head-Mounted Display), according to Isobar’s Christie. The solution ultimately entails integrating cameras into the front of VR HMDs to enable video pass-through for the user to see their surroundings while still wearing the HMD. “Such a system would be highly portable and starts to feel a lot more like augmented reality,” Christie said. HTC plans to invest in companies exploring some of those capabilities with its Vive X business accelerator program. The second round of Vive X was just launched with the selection of 30 startups focused on augmented reality and virtual reality. Among the 30 companies selected, three are platforms for brands and advertisers, two involve analytics, eight are content studios, four are content creation platforms, three are focused on enterprise and three involved social VR.